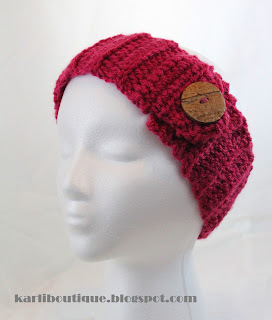 I whipped up this back loop simple ribbed headband in under an hour, while watching Ellen. I wanted to try it out with a decorative button and a rounded-end. 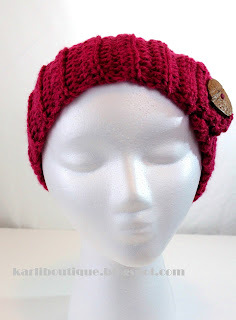 I used Lion Brand Vanna's Choice in Antique Rose and the photos come out more red but the actual colourway is a deep pink. I really like it and might keep it for myself...or put it on in my shop and make another one. This pattern only takes about 1/4 of a Vanna's Choice skein. Free Pattern for download here PDF. Sew on wood button on top of rounded flap you just created. Feel free to use this and any of my patterns for personal use. If you sell the finished product or post online, I just ask you kindly link back to this page. Enjoy! Download the PDF for this pattern here.